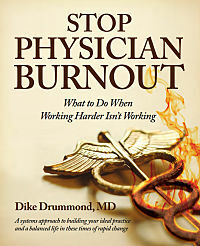 Where can you turn for field-tested tools to prevent physician burnout? If you search the internet for help, often all you see is "list articles". Now that kind of advice is fine. BUT, they never tell you how to do these things or where to find the time in the first place. 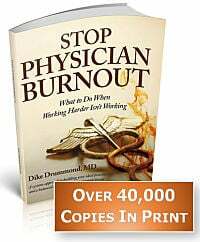 As a full time executive coach working with hundreds of physician clients I can tell you this for sure - if these are the only steps you take ... your stress levels and burnout risk won't budge. Most likely these so-called tools will make things worse because you will blame yourself when nothing changes. Is your practice a genuine battle ground? You still love seeing patients but all the EMR and data entry tasks leave you completely spent by the end of the day. Sometimes it seems like a battle between face time with the patient and charting. Or maybe you really like your practice - but there are still a couple of stressful issues you haven't been able to change. Either way, a quote from Einstein points us to a method to find the way back. For the practicing physician this means - you can't solve the problems in your practice while you are working in your practice. You are too busy, too distracted, too immersed in the problems themselves to be able to see solutions. You have to get out of your practice and look at what you are doing from a new perspective. This is the only way to see what's not working with the clarity required to know what you need to change. We are not talking about picking a tip from an internet list article. This is taking a good look in the mirror at the habits that have you stuck - and engineering a way forward. This is how you put burnout to its highest and best use. You don't have to do this all alone. We can help. This is a very intimate group of only eight like-minded physicians. ... all that is missing is you. "The time I spent at the retreat away from my life, the collegiality of my peers, and the regular ongoing support afterwards that is a unique part of the program, gave me the time and permission to reflect, explore and redirect my professional life. One year after signing up, I am much more content and joyful. I have been able to reconnect with the basic pleasure of just seeing patients. 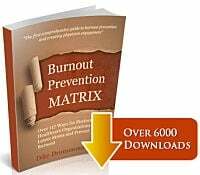 Over 120 different tools - all proven effective by real doctors in the trenches of modern patient care. Bulk orders - for your department or group are available at significant discounts. 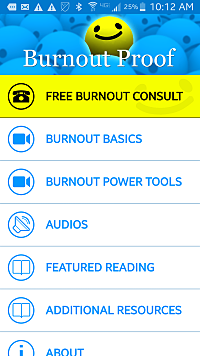 Lower stress, learn a new prevention tool, instant relaxation with guided imagery and meditation audios -- its all in our "Burnout Proof" mobile APP. We are in the final stages of testing. Here are several screenshots. Our launch is July 19th, 2015. Early Birds have a 24 hour window for a FREE Download. This could be the time when everything turns the corner. We both know list articles aren't what you need. 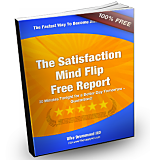 You are looking for real change and want tools that you know will work. These three resources can help you find new solutions to old problems and put you on the path to a more Ideal Practice. CLICK HERE to contact us directly if you have any questions or would like immediate help.